Looking forward to a great week-end at this sold out event! I'm sorry I can't make it to this event. Looking forward to seeing how many Distinguished patches get earned. Tomorrow's the day. Going to be soggy. I'm bringing two 10'x10' easy-ups. Just changed how my sling attaches to the rifle. You know what they say about futzing with things at the last minute. Oh well! What an outstanding weekend!!! 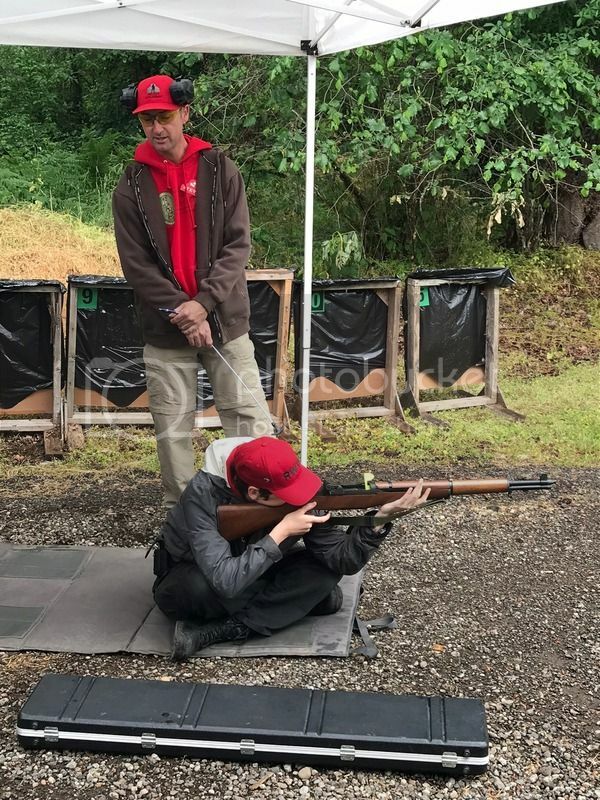 Despite the weather forecast for thundershowers, 29 shooters came to learn on Saturday and 26 enthusiastic shooters came back for Sunday. We passed out 4 Distinguished patches I lost count of how many new Rifleman we had, maybe 5 or 6. Congratulations to all the new Rifleman. 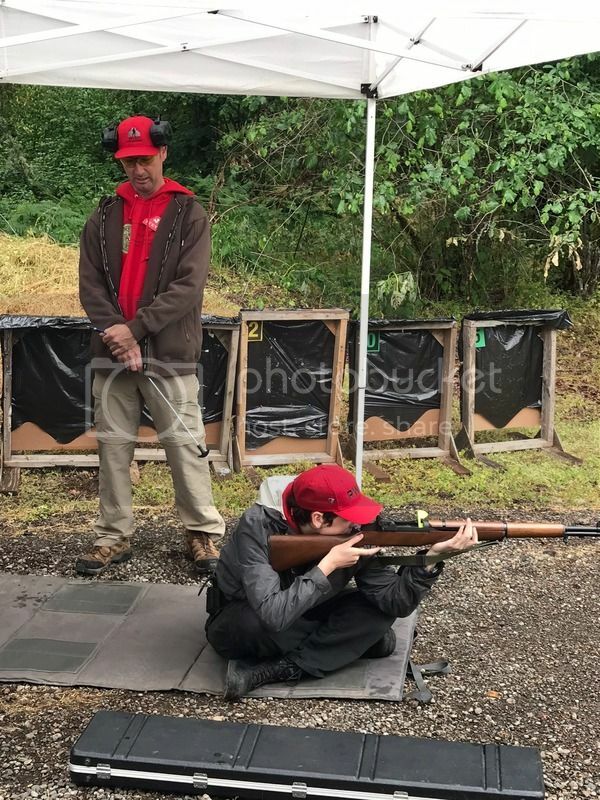 To those who were close a little dry practice and one more Appleseed is all you need. I look forward to seeing you all on the line. Big shout out to Earl for driving down from Tacoma and ScubaSteve for flying in from Florida. Your help was much appreciated. Thank You to everyone who came out!! I will post all my pictures later tonight. It was a fantastic weekend! I learned a ton! Thank You ScubaSteve for all of your advice, and directions! It was a pleasure getting to learn from (and work with) You! One of the Pictures of ScubaSteve and Flipper explaining and demo-ing the seated position. It was great working with you guys. Hopefully I can come back one day. I will by a coat before coming next time. Us thin blodded Florida guys are not used to 45 and rain all day. Great shoot and great people, looking forward to seeing you again. Here are my photos. I think I got photos of almost everyone. These include Rifleman photos for Johnny, Ryan, Todd, and Jamin. Along with Distinguished photos for Dave, Michael, and Todd. Jane should have the rest of them. "Throw down your arms, ye rebels, disperse!" Wow! great job shooters and instructor crew, that is a ton of Riflemen patches earned. Glad to be of help. Hope to see y'all again on the range. ... to catch the fire in another American for sharing the skills and our heritage to our posterity. Maybe my perfect shots will be made by those I met along the trials and trails of Appleseed. I know that America is a nation of Riflemen. Great weekend. Thank you all for coming out and sticking it out through the weird (well standard PNW I guess) weather. Thanks for coming cross country to help us ScubaSteve. Great to have you there. Congratulations to all our riflemen. New: Mike N., Dan, Todd, Johnny and Ryan. Mike N. and Todd repeated and improved for distinguished. Repeat: Sam, Dave, Doug and Randy. Sam, Dave and Doug shot score for distinguished. Must mention here, all of Sam’s scores were between 247-249. I tried to get this all written down, but if I missed something please correct/add it. We have a new Applecore Blue Hat! Thanks for stepping up Melissa!